After months of delays and years of underfunding, the US Congress finally revealed its plans for funding the federal government in 2016. 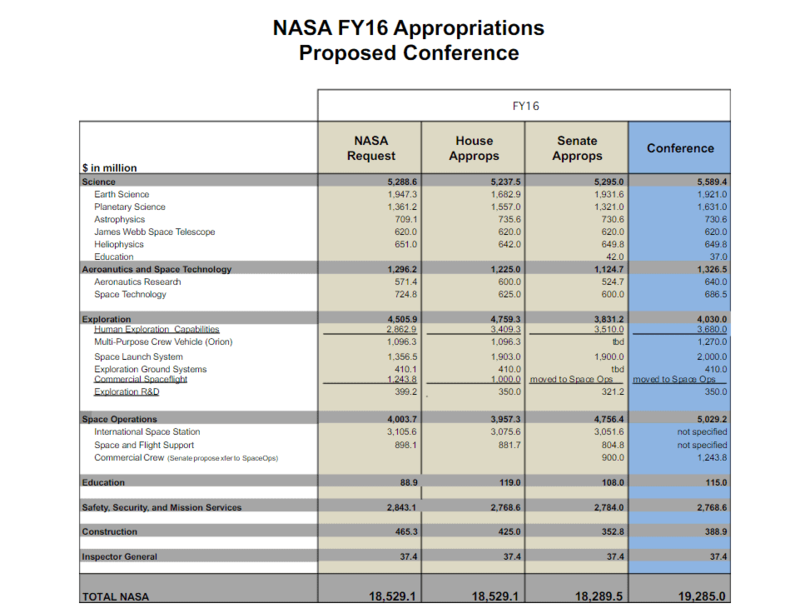 If the budget passes without major modifications, NASA will finally get what it asked for – and even a bit more. The space agency is set to receive $19.3 billion—nearly $1.3 billion more than in 2015. It’s been a tough few years for NASA in terms of funding. The Obama administration significantly slashed NASA’s budget, and Republicans wanted to push it even further – they wanted NASA to stop studying Earth completely, annoyed by the agency’s findings on climate change. So it’s quite surprising to see that the space agency’s budget was not only approved, but even surpassed. This money will allow both the MER Opportunity rover and the Lunar Reconnaissance Orbiter to continue science operations, as stressed by researchers. It also provides $175 million for the new Europa mission, allowing them to develop a lander, and an additional $25 million for “icy satellites surface technology” development. The Mars 2020 rover gets an additional $22 million to keep the project on track. In terms of commercial crew, NASA will get $1.243 billion to keep both Boeing’s CST-100 Starliner and SpaceX’s Dragon V2 on track for 2017. Sure, it’s great that they got what they asked for (and a very small bonus, to preempt potential delays), but when you think about it, $19 billion is not that much for the US budget. The country spent 3% of their GDP on military projects – that translates into $581 billion, 30 times more than NASA. Even the so-called black budget, the budget allocated for confidential projects or money that the military doesn’t want to justify was estimated at $50 billion in 2009. A single warship, the USS Gerald Ford, deployed in 2016, costs upward of $13 billion. A single Air Force F-35A costs a whopping $148 million, while a Marine Corps F-35B costs an unbelievable $251 million. A lone Navy F-35C costs a mind-boggling $337 million. This simply dwarfs NASA’s budget by comparison. Still, if passed, the budget will be very significant – if not for anything else, then for breaking a chain of saddening budget cuts. The bill was labeled an “omnibus” because it mushes together what would have been twelve separate pieces of legislation into a single, 2,000 page epic.